The provincial Green Party is trying to eliminate cash-for-access political fundraising in the province. Ontario Green Party leader and Guelph MPP Mike Schreiner has introduced a private member’s bill aimed at slashing the fundraising method. If passed, the bill would cap the ticket price of political fundraising events at $100. Noting that the Progressive Conservatives had recently held a fundraiser that cost over $1,200 to attend, Schreiner accused the party of changing its tone on the issue of money in politics. He says the party supported tougher finance rules in opposition, but relaxed them as soon as the PC government came to power. 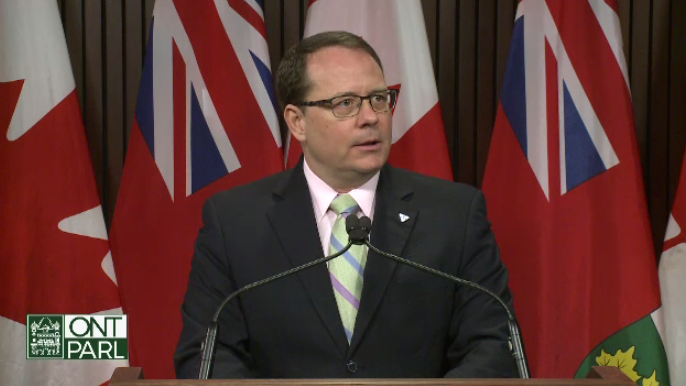 Mike Schreiner introducing a private member's bill to reduce cash-for-access fundraising.